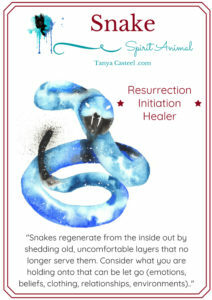 Snake symbolizes renewal, resurrection, initiation, healer and environmental sensitivity. Snakes regenerate from the inside out by shedding old, uncomfortable layers that no longer serve them. Consider what you are holding onto that can be let go (emotions, beliefs, clothing, relationships, environments). Snakes are conscious and strategic about where they place their energy and spend their venom when catching a meal. This asks you to evaluate how much energy you’re “putting out versus calling in” with your money and work. Is there a way to use your energy more efficiently to provide for yourself, benefitting yourself and others in a sustainable manner? 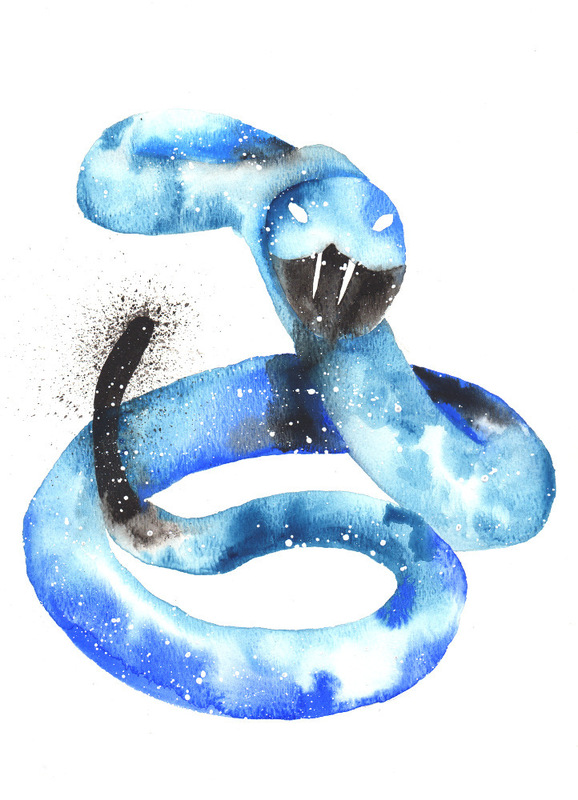 Trust in your inner Snake abilities to strike quickly, decisively, and accurately as you call in abundance to yourself. As a reptile, Snakes are mindful of their temperature and are very sensitive to their environment (and emotions). Check in with your own “temperature”. What outside hot or cold forces are you allowing to influence you? Is it aligned with your core values? If not, adjust your temperature by moving yourself into hotter or colder emotional/physical surroundings to be more aligned with your true self. I want to hear about your Snake experiences. What stories or dreams have you had? Please share and join in the conversation below!